Follow the instructions on the candy wafers package to melt the candy in a wide bowl. For each bone, press marshmallows onto both ends of a pretzel stick or rod, with the marshmallows' flat sides parallel to the pretzel. Dip each pretzel into the melted candy to coat it. Lift it out with a fork, letting the excess drip back into the bowl. 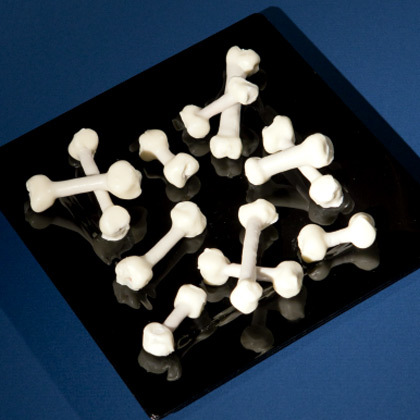 Place the bone onto a sheet of waxed paper to set at room temperature. Paint scars and mouths on a ceramic plate as shown (squiggly mouths and "stitches" are covering a plate). Let them air-dry over night.Prepare the gelatin according to the package directions. 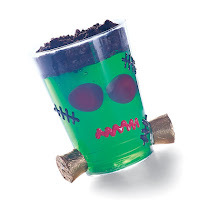 Pour slightly cooled gelatin into the cup, stopping 1/2 inch from the top.Refrigerate until the gelatin is partially gelled, then remove the cup from the refrigerator and use a table knife or spoon handle to push 2 cherry eyes into the gelatin. Refrigerate again until the gelatin is completely set.Use double-sided tape to attach the neck bolts. Peel the scars and mouths off the plate and place them on the cup (they'll adhere like Colorforms). If it's difficult to peel the shapes off the plate, stick the plate in the refrigerator for at least 10 minutes, and they should come off easily. Variation: it may not look as cool as the paint, but kids can also use a permanent marker to draw the face on.Cover the top of the gelatin with crushed Oreos hair. Don't wait too long to gobble up the monsters, or the hair will get soggy. Prepare the pudding according to the package directions. 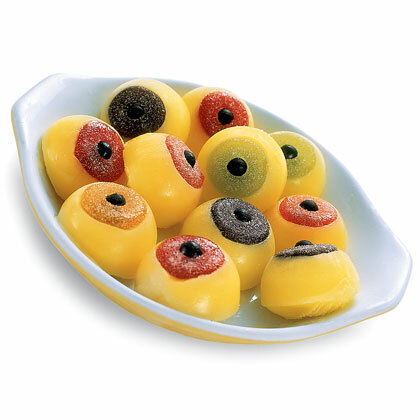 For each eye, fit a jelly bean into the center of a LifeSavers Gummies candy and place it in a plastic egg half. Fill the egg cup with the pudding, then place the egg halves in an egg carton in the freezer until they're firm (about 3 hours). Remove the egg halves from the freezer and let them sit at room temperature for about 3 to 5 minutes. With the back of a fork, gently press down on the edge of the pudding, rolling the frozen ball out of the egg cup. 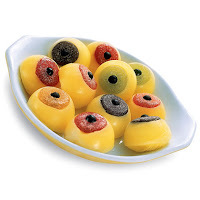 If you're not serving them right away, place the eyes in a freezer-safe dish in the freezer until you're ready. 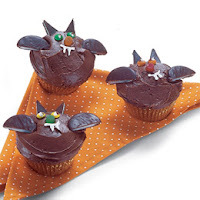 Frost a cupcake (baked from your favorite recipe) with chocolate icing. For the bat's face, set two M&M's Minis in place for eyes and add a jujube candy nose. For the wings, cut a Thin Mint (we used Haviland brand) in two and set the halves in place as shown. Then cut an Andes Crème de Menthe candy in half diagonally and set the pieces in place for the bat's ears. Finally, add a white frosting mouth, fangs, and pupils. Coat each baked cupcake with chocolate frosting and partially insert a Nutter-Butter cookie into the top. Frost the remaining cookie with vanilla frosting. 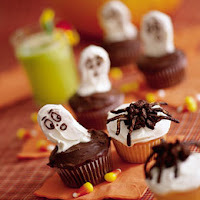 Draw a spooky expression on each ghost with the decorator's icing. Makes 24. Make the spiders by combining the chocolate chips and milk in a glass bowl. Microwave on high for 1 to 2 minutes, stirring frequently, until smooth. Stir in the peanuts or cereal and chow mein noodles. Drop by teaspoons onto waxed paper. Stick on extra noodles for spider legs and chill. Frost the cupcakes white. 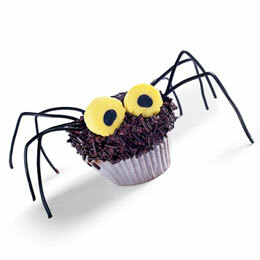 Then top each cupcake with a spider. Makes 24. Frost the cupcake with chocolate icing and cover with sprinkles. Press the eyes into place. Use scissors to cut eight 4-inch pieces of licorice for the legs. Holding all of the legs together in a bunch, bend them in half and crease. Push the end of each leg into the cupcake as shown.